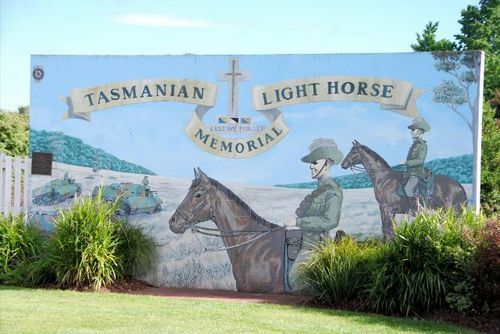 A mural commemorates the centenary of the raising of the Tasmanian Light Horse at Ulverstone in 1899. During the year 1899 a division of Tasmania Mounted Infantry was formed at Ulverstone and in 1900 the Mounted Infantry in Tasmania consisted of one company at Hobart and a division each at Ulverstone, Brown"s River, Brighton, Sorrell and Deloraine. On the Federal re-organisation of 1903 the company at Hobart, the Ulverstone division (or troop which it then was) together with a troop from Ross, were formed into the 12th Australian Light Horse Regiment. In 1912 the 12th became the 26th Light Horse (Tasmanian Mounted Infantry) continuing as such until 1921 when its designation was altered to 22nd Light Horse (Tasmanian Mounted Infantry). THIS MEMORIAL WAS UN-VEILED BY THE PRESIDENT OF THE 22 LIGHTHORSE & MOTOR REGIMENTS ASSOCIATION Mr NEIL DOBSON ON THE 27TH OF FEBRUARY 1999 TO CELEBRATE THE CENTENARY SINCE THE TASMANIAN MOUNTED INFANTRY WAS RAISED AT ULVERSTONE IN 1899.